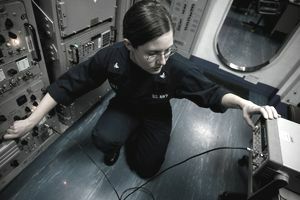 Electronic Technicians (ETs) are responsible for electronic equipment used to send and receive messages, computer information systems, long range radar, and calibration of test equipment. They maintain, repair, calibrate, tune, and adjust electronic equipment used for communications, detection and tracking, recognition and identification, navigation. Note: Also see ET(N) - Nuclear Trained Electronics Technician. Jobs performed by ETs are performed throughout the Navy's fleet of surface ships including aircraft carriers and Aegis cruisers and destroyers, and at communication and repair activities ashore. Note: Many ETs go on to receive advanced training (C School) directly after completing A-School). Sub-Specialties Available for This Rating: Navy Enlisted Classification Codes for ET.